Frankston is a regional suburb at the north of the Mornington Peninsula facing Port Phillip Bay, 40 km south-east of central Melbourne. 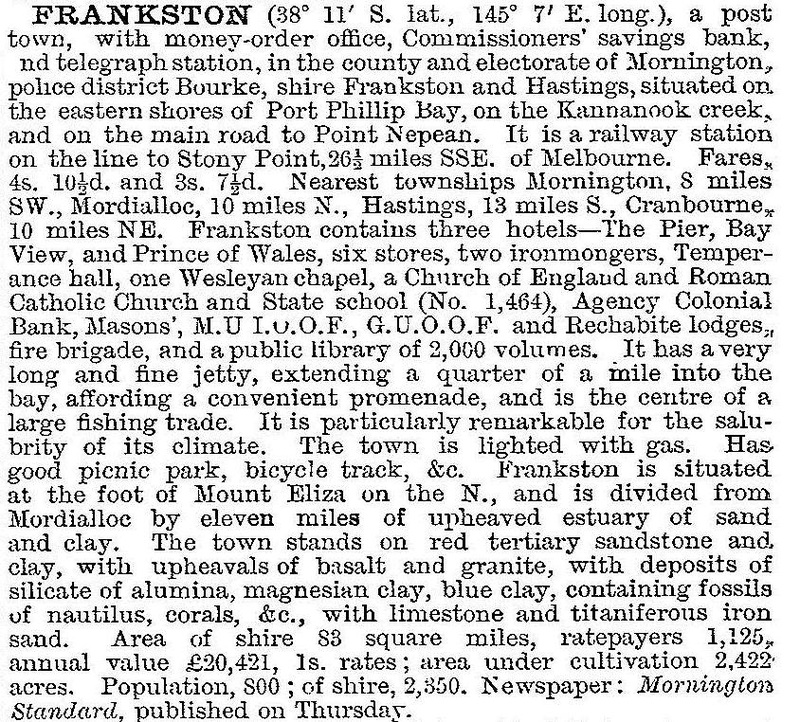 Frankston was a fishing village with a pier (1857), which was also used for the loading of firewood cut from the area. Until 1880 the population barely exceeded 150 people. An Anglican school was opened in 1855. In 1882 the railway line was extended from Mordialloc to Frankston, which ushered in a decade of strong growth. The railway brought Melburnites within reach of Frankston's beach, although locals thought that the train fares were discriminatory and discouraged day trippers. The Frankston Brick Works was established in 1886 and a number of public facilities - mechanics' institute, coffee palace, library and police court - were built in the 1880s. The Kananook Creek, an outflow from the Carrum Swamp, was a silvan waterway until its flow was reduced by diversion of the water from the Carrum Swamp into an artificial drainage canal, the Patterson River. The loss of flushing of the stream caused the Kananook Creek to become an unpleasant chain of waterholes, giving Frankston a reputation for an unhealthy environment. The economic depresssion of the 1890s magnified Frankston's misfortune, barely offset by Frankston and Hastings Shire being formed in 1893 by separation from Mornington Shire. Frankston's population fell by more than one third during 1890-1900. In the opening decades of the twentieth century there were rudimentary electricity and gas supply schemes. Persistence was rewarded when in 1922 there was also electrification of the railway service. Frankston high school opened in 1927. In 1934 Frankston was further rewarded with a place on the world map when an international scout jamboree was held there. Although the jamboree's site (near Frankston high school) was in bushland it had water and electricity supply. In the next economic depression experienced by Frankston in the 1930s its population increased rather than fell. Frankston's bushland extended through the farmlands across the Mornington Peninsula to Hastings. Frankston also had a growing urban component along the bayside, northwards to Seaford and southwards to Mount Eliza. Tensions between urbanising Frankston and its rural hinterland intensified, persisting until severance occurred in 1960. Mount Eliza was the choice for holiday homes by many well-to-do Melburnites along with its foothill, Olivers Hill, which is south of Frankston's central area. Roy Ground's heritage listed round house (1953) is on Olivers Hill. The dune between Kananook Creek and the beach, known as Long Island, was also the location for holiday homes in the interwar years, some of experimental design. A pumping system (1930) had restored some water flow to the creek, although an adequate system was not in place until the 1980s. After World War II cheapness of land and an under-resourced council building inspection service led to a burst of cheap housing, exacerbated by shortages of building materials. Subdividers provided makeshift roads, and the council was reluctant to take responsibility for some of them. Demand for land and houses nevertheless persisted, and the Housing Commission began an estate on a former pine tree plantation in the 1950s. The Frankston Forest primary school (1961) and the Monterey high, primary and technical schools (1965-67), north of the Long Island Country Club, were named in observance of the former plantation. The suburb is now Frankston North (see separate entry). East of Frankston the Commission and A.V. Jennings Industries built the Karingal estate in the 1960s. Frankston Shire's population increased by 35% during 1961-66, to 42,000 people. Retailing advanced further in 1968 when Ball and Welch opened a branch emporium, and again in 1972 when the Town Centre shopping complex was begun. In 1978 the Karingal shopping centre, with a discount department store and 95 shops, was built. Frankston has also become a regional education centre. There is a TAFE on the site of the former technical school (1958) and before then the high school, and a campus of Monash University on the former teachers' college (1959). The Frankston Community Hospital (1941) was enlarged to become a regional facility by extending into parkland. The residual land is the George Pentland Botanical Garden, named after Frankston's town clerk (1949-75) who oversaw Frankston's postwar transformation. He became the Victorian Director-General for Local Government. In 1972 Frankston's retail precinct received a massive boost northwards with the drive-in Bayside Shopping Centre. It has a Myer department store, several discount department stores, over 250 outlets and over 3500 car parking spaces. Retailing was concentrated between the Nepean Highway and the railway line. The ambitious 12-storey Peninsula Centre (1980s) on the highway north of Wells Street fell vacant. The Dimmeys store, also on the highway, was vacated in 2007. Northwards, at the gateway to the 'Gateway to the Peninsula', the Ambassador Hotel shared their fate, along with a miscellany of other unused buildings with Nepean Highway addresses. Frankston was noted for highway derelicts, often involving costly demolitions because of toxic building materials. Once described by Barry Humphries as the world's ugliest building, the Peninsula was refurbished for 65 residential apartments and 86 service departments in 2013. Frankston has numerous public reserves, mainly on the city's outskirts. In Frankston's north there are three golf courses and the large Pines Flora and Fauna Reserve extending to Langwarrin. A fourth golf course is to the south. There is a continuous beach from Olivers Hill to Seaford with a pier, yacht club and a life saving club. The Kananook Creek reserve is at the mouth of the waterway. As well as the numerous State primary and secondary schools, there are Catholic primary and secondary schools. A cultural centre was opened in 1998. Figures from 1954 to 1991 are recorded for the municipality as a whole and are found under Frankston and Hastings Shire.